I bought a complete 429DE gun. It has the same tall front sight as yours. I haven't fired it yet, but I put a laser in the bore it looks like it's going to hit 12-14" low at 50 feet. It doesn't surprise me a bit. My first DE was a 44 Magnum I bought when they first came out around 1987. That POS had all sorts of problems and hit about 12" high at 50 feet. Even at 100 yards, it was WAY over the target. I ended up machining the rear sight down to the point the notch was nearly gone and then had to recut the notch nearly down into the base. I also bought a complete 440 Corbon gun when those came out in 1997 or so. It didn't have any sight problems but ejection was rather wild to say the least. Back in 1999-2001 we made about a dozen AR-15 uppers in 440 Corbon and I still have the chamber reamer and head space gauges. Just for the hell of it, I dropped the 440 Go-Gauge into the 429DE barrel and the bolt won't close on it, nor will it chamber 440 Corbon ammo. It appears though, that a 429DE round would chamber in a 440 Corbon barrel, but of course you would most likely have excessive head space. Notice the big gouge under the "Made in USA." It's like that on both sides of the frame. I'm not sure what's going on there. Edited to add - I guess they are all like that. Back in 1999-2001 we made about a dozen AR-15 uppers in 440 Corbon and I still have the chamber reamer and head space gauges. I dropped the 440 Go-Gauge into the 429DE barrel and the bolt won't close on it, nor will it chamber 440 Corbon ammo. I appears though, that a 429DE round would chamber in a 440 Corbon barrel, but of course you would most likely have excessive head space. Interesting... thank you for sharing your sight height. Persons as yourself reporting these odd hit barrels has me curious now. I realize you have not tested this in practice, but a bore gauge is a close indicator of Point of Impact. My bore gauge isn't terribly accurate (if I spin it around) but still shows almost exactly what I experienced in firing at the same distances. If it ever stops raining here I am going to bench all of my barrels and see what I really get at 100 yards. I have yet to even swap my 429 front sights... they seem to need the "standard" front sights to shoot at the correct elevation. Your stainless barrel seems to be one piece and mine are two part... which I have always considered to be US made and Israeli made, respectively, although nothing is certain. So this is really interesting they both shoot "the same", possibly being made in separate facilities. Strange to me, but I am not a barrel maker and don't know what exactly causes this. Simple physics says that they are simply bored inaccurately. I am a machinist, but not a gunsmith. Very interesting you mention the wild ejections... that is what I get with both barrels on any frame with any slide with any bolt. Maybe its a "feature" of the case shape, as the ammo seems really consistent. I have been wanting to buy a high speed camera of my own to look at these things with. I notice no difference between the two different 429DE loadings ejections either... even more reason to suspect the case shape. I definitely notice change in ejection with various loadings in other calibers in a Desert Eagle, but throwing brass to the left I have not experienced before the 429DE. Maybe we can get some 429 reamers and loading dies before too long. My 440 Corbon gun would throw the brass to the left as well....even with a death grip on it. I think the slide velocity might be kinda slow in the DE, which may be causing the ejector tension to partially unload when the case shoulder clears the chamber mouth, but the neck is still supported by the back end of the barrel. The case may start to eject, rotating outward and off the bolt face, but then stops as the neck is dragged across the last part of the barrel entrance. Then when the neck finally clears the back of the barrel, the ejector either doesn't have enough umph to throw it clear, or it simply looses tension and falls off the extractor causing the case to drop free, uncontrolled, and then is hit in mid air by the recoiling gun. Edited to add: I pulled out an old Tromix 440 CorBon AR-15 and found that 429 DE cartridges will chamber just fine....however there may be excessive head space. I need to make a 440 gauge to confirm exactly how far out the head space is between the two. A 440 Corbon cartridge will not chamber in my 429 DE pistol. Last edited by TonyRumore; 01-28-2019 at 03:55 PM. I made a 440 Corbon case gauge and set it up with the Go-Gauge flush with the top of the 440CB cartridge gauge. I then dropped in a factory HSM 429DE round and measured it with a depth micrometer. The 429DE round dropped .013" below the top of the 440CB gauge. So, if your 440CB barrel was cut to the very tightest (shortest) possible in-spec chamber, you would have .013" head space when firing an HSM 429DE round in your 440CB gun (at least with this lot of ammo). However, there are probably no 440CB chambers cut that tight and most are probably about .003" off the Go-Gauge, so the most likely amount of head space would be more like .016". That's quite a bit. I just emailed RCBS, Hornady, and Lee as well as MRI, asking if any of them had plans to produce reloading dies for the .429DE. I'll report back if I hear anything. Thank you for the email. At this time we are not. I will pass on a suggestion and see what we can do. We expect to have the dies here and ready for sale in aprox. 6-8 weeks. The next step will be to get some of the bullet, powder, or loading equipment manufacturers (or even MRI - hint, hint) to start working up data. Something developed with actual pressure equipment is going to be better than us home reloaders just watching for primer flattening. Having viable support for reloaders is paramount to making this semi-wildcat round a success. But I expect we should be able to safely get above the velocities listed for the current .429 factory ammo. I can get over 1500 fps with a 240 gr .44 Mag now, using published book loads. Last edited by GarrettJ; 02-04-2019 at 02:48 PM. FWIW, back in 1999 Corbon was using 30.6gr of H110 behind a 240gr XTP in the 440 Corbon Mag, and 25.0gr behind the 300gr Solid. I like the idea. I've fired the .440 cor bon desert eagle and seen that it was a great idea poorly executed. I personally have been wanting to do a similar cartridge for years but lacked the resources to do so (which should change next year. But mine is a .308 shortened and bottlenecked down to a 9mm or .357. The idea is a handgun that competes in accuracy and power with rifles st up to 300 yards so you are not naked when reduced to sidearm. I plan to start making a few different handguns next winter and may start in it too. 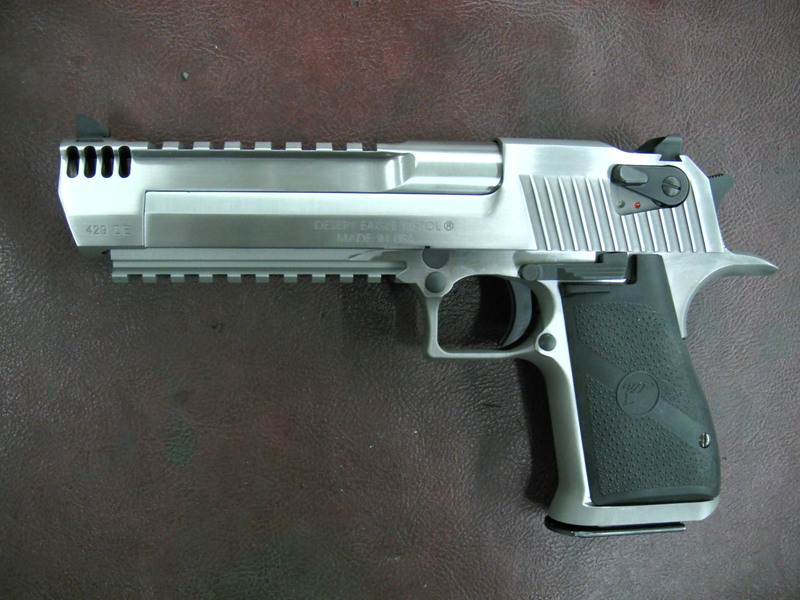 Meanwhile, i am very much open to getting a Desert Eagle barrel in this caliber. Do we have any loading data for the 429 DE yet?